Rumak on the rampage at the 1991 British Nationals. Rumak with his last owner, Michael Harris, in 2000. 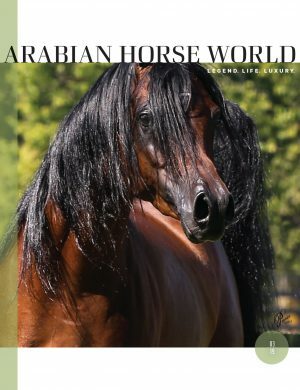 After more than 45 years, I can safely say that taking photos of Arabian horses is an enjoyable and rewarding way of spending one’s time. It can get a bit stressful, but it’s fun and normally not especially dangerous. In all those years, there was just one occasion when I was well and truly terrified. But in the end, it turned out to be just a small part of a larger story. I first saw Rumak (Partner x Rucasja) in 1985, as a two-year-old just imported from Blommerod Stud, Sweden, to Germany. 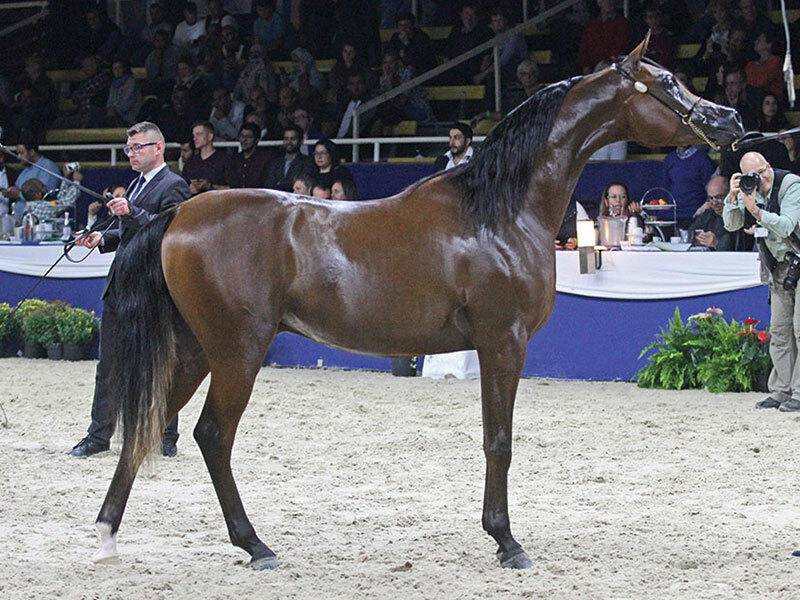 Pure Polish, with near-flawless conformation to match his impeccable breeding, he was impressive on that account alone, and he did well at the shows. This was back in the days when an in-hand inspection and a performance test under saddle were mandatory for all breeding stallions in Germany, Arabians included. Naturally, the inspection was no problem for Rumak. He was even awarded a premium. However, he did not keep it for long because the required performance test failed to follow. This puzzled me at the time because a horse with his conformation and movement, unlike many of today’s show champions, was made to be ridden and to perform. But instead, after siring two crops of foals, he was sold and departed for Britain. 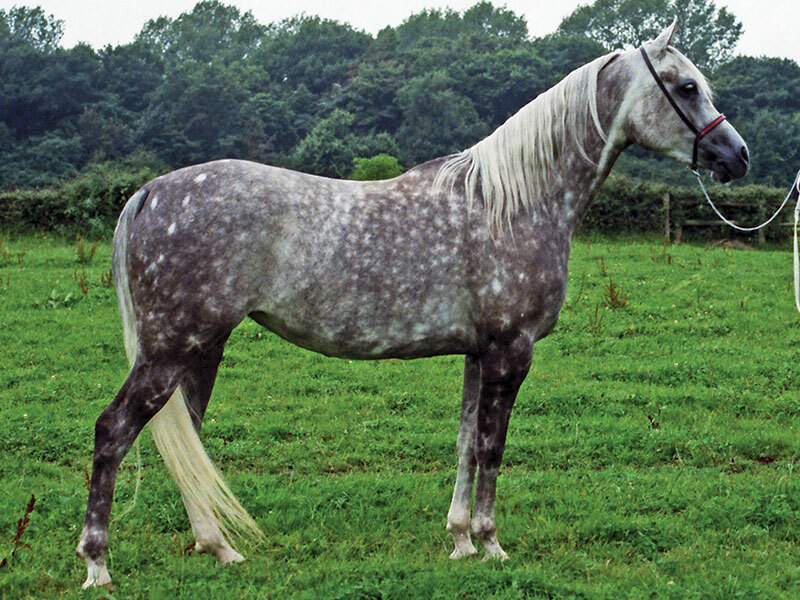 In England, Rumak joined the stud of Paolo Gucci, who was busily buying Arabian horses at the time. 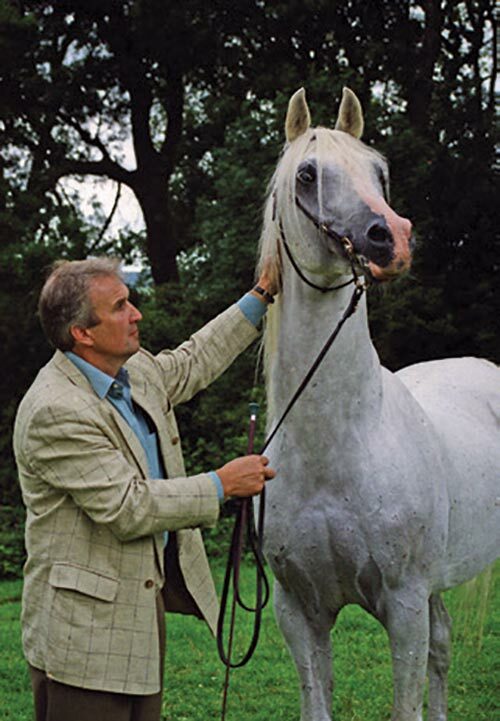 Having matured quite spectacularly, Rumak resumed his show career and became hugely successful, culminating in the World Champion Stallion title at Paris in December 1990. 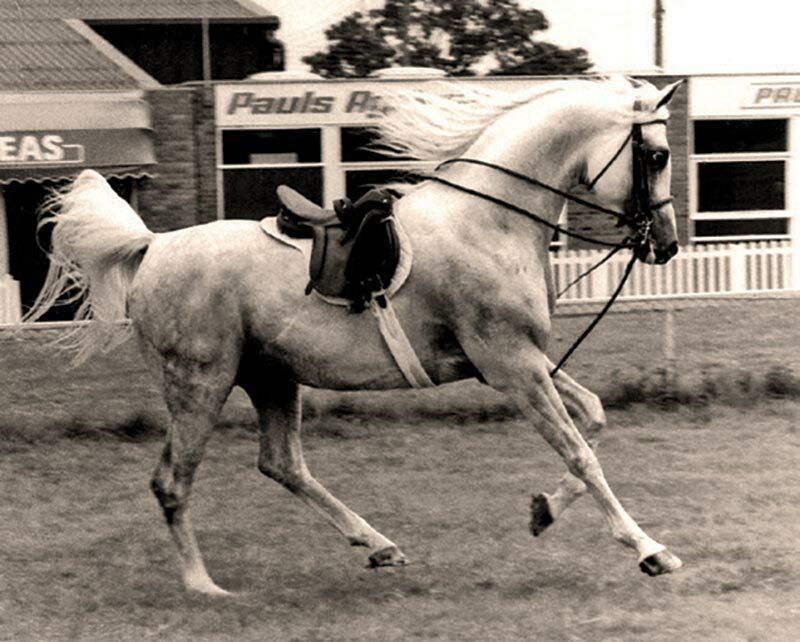 In 1991, at the British National Show at Malvern, I noticed that Rumak was entered in a class for ridden stallions. Even then, it was highly unusual for a World Champion to be shown under saddle. This was something I was not going to miss! So there I was in the center of the ridden ring with the other photographers, as the class of ridden stallions filed into the ring. 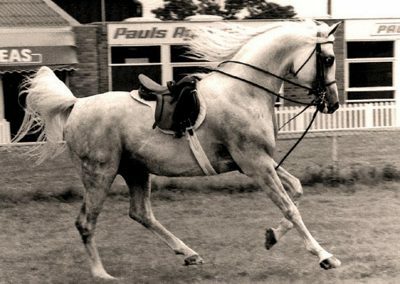 Among them was Rumak, a vision in white, and, just as I always knew he would, he looked great under saddle. In short order, Rumak had enough of it, switched into rodeo mode, unseated his rider, and went on a full-out rampage, chasing the other competitors. All hell broke loose. And I, along with the other photographers, was stuck in the center of the ring with no cover and no way of getting out, with panicked horses and riders charging madly around on all sides and an unleashed Rumak going after all of them, until he picked out one chestnut stallion that appeared to irritate him particularly. Rumak kept attacking him, occasionally cutting through the middle; that poor horse’s rider must have been even more terrified than I was, and I’d never been so scared in all my life. I did keep my wits enough to take photos, though, as the accompanying shot proves! Well, eventually the horse and rider under attack fled from the ring with Rumak in hot pursuit, and I guess they managed to catch him before anyone got seriously hurt. The class resumed, minus two entries, in a more orderly fashion. But to this day, I have never gone back into the center of the ring during a ridden class. Needless to say, Rumak was never shown under saddle again. He did appear once more at the British Nationals, though. 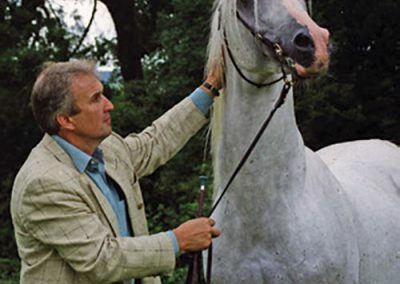 I was waiting for the senior stallion halter class in 1998 when, from the distance, I caught sight (and sound) of a white stallion screaming and standing on his hind legs. Checking my catalogue, I discovered it was none other than Rumak and decided to keep well out of the way. I spent the entire class in a state of nervous apprehension, frequently checking on what he was doing, and making sure I was within easy reach of the exit, just in case. Nothing happened, but the fear remained. My last, and closest, encounter with Rumak was just two years later. By then the Gucci stud had come to a sorry end, and the surviving horses had been dispersed. 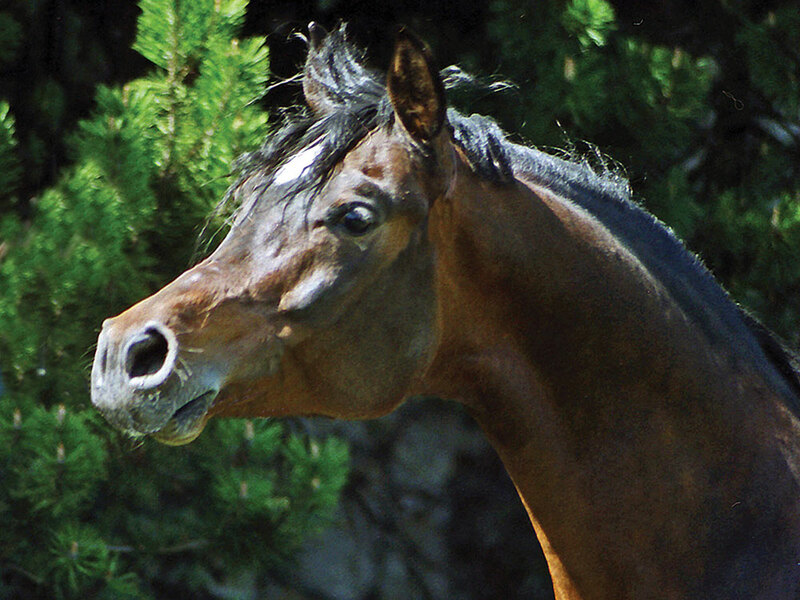 Rumak had found his final home with English breeder Michael Harris of Combe Farm Arabians, who had admired him for many years, purchased some of his German-bred daughters and had previously leased him, breeding several very successful daughters. None of his offspring, so I was told, had any temperament issues, and this is a farm where the horses are ridden and sold as riding horses. So how did this fit? In 2000, I visited Combe Farm with a stud visiting tour from Germany. When I cautiously inquired about Rumak, Michael assured me that he was perfectly fine and, yes, he was riding him and it wasn’t a problem. He later showed Rumak to us himself, and indeed, Rumak was on his best behavior and made not the slightest fuss, even when a mare and foal were brought out to meet him. He was, in short, a totally different horse from the one I remembered (apart from still being outrageously handsome, of course). And at the end of that memorable visit, I agreed to do something I would never, ever have thought I’d be doing: I visited Rumak in his stable. If anyone had told me a few years earlier that one day I’d find myself inside this horse’s stall, with him loose and unrestrained, I’d have declared them crazy. But there I was. And there was Rumak, perfectly calm and gentle and nothing at all like the rampant monster that had haunted my memories for years. So I was finally reconciled with the one horse that had ever scared me. In retrospect, I realize that Rumak’s problem must have been other stallions. He was fine with people and with mares and foals, and he really was the excellent riding horse I knew he could be. But when he was around other stallions, his testosterone went into overdrive. It was possible to control him in the show ring, but if someone happened to be on his back, it was just too bad. He failed his performance test not because he wasn’t rideable or wasn’t athletic, but because all he saw were rivals. It doesn’t make what happened in 1991 any less scary, but does put it into perspective. 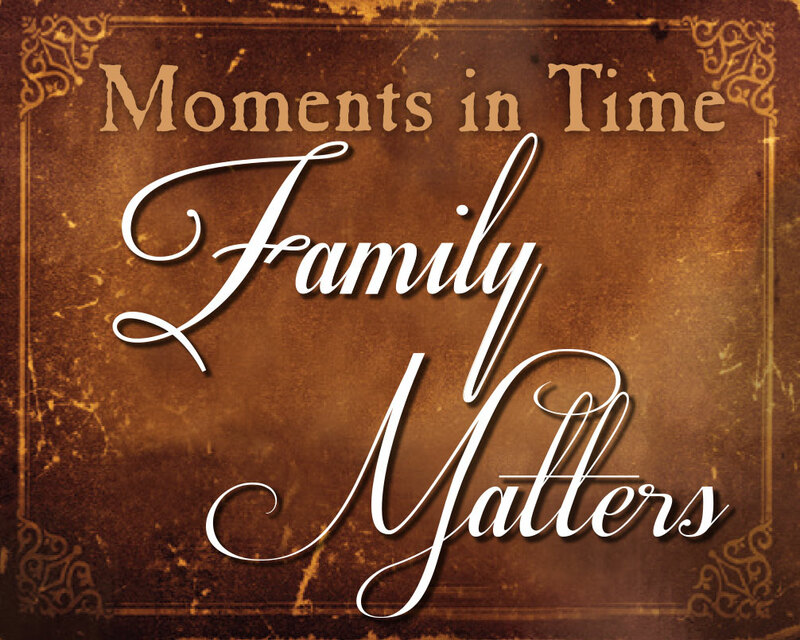 At his final home, he was kept well away from the other stallions, he was loved and cared for better than ever before, and at the end of his long life, he left a rich legacy through the lovely daughters he sired there. Ultimately, that is what really counts.